Dark clouds rolled in ominously over the Monte Carlo circuit as qualifying was about to start. Ferrari were working hard on Felipe Massa’s car, as the Brazilian had crashed in final practice. Lotus had a similar job to do on Romain Grosjean’s car, whilst Adrian Sutil also crashed, but he was patched up and ready to go when Q1 began. Massa never made it out of the garage, and thus dropped out early, technically not qualifying. Jules Bianchi’s car overheated before he finished a single lap, so he also faced a DNQ. Giedo van der Garde, meanwhile, got through to Q2 at the expense of Paul di Resta. Rain showers meant qualifying started on intermediates, but the second session saw a switch to dry tyres. The only surprise in Q2 was Grosjean out, as Kimi continued. The top ten shootout saw times dropping constantly, with the two Mercedes drivers doing battle with the two Red Bulls. 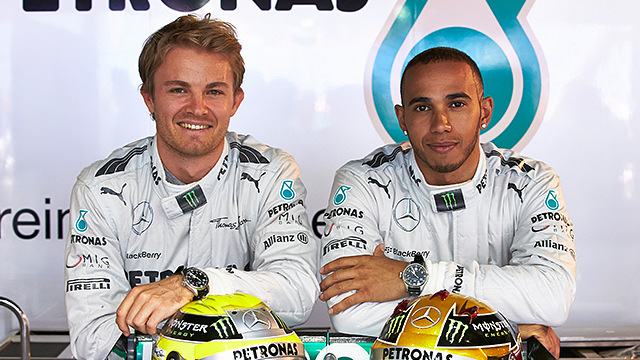 It was Nico Rosberg who took the top spot, his third pole position in a row. Hamilton settled for second, with Sebastian Vettel and Mark Webber securing the second row for Red Bull.